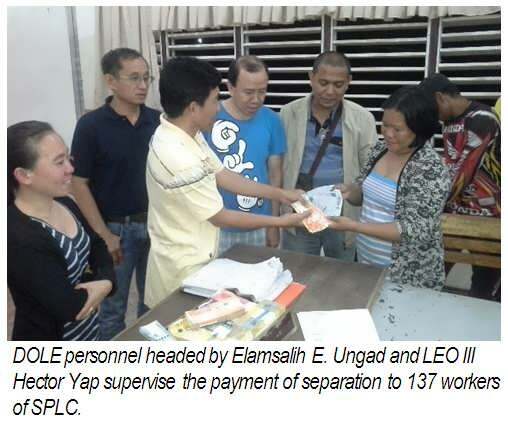 Sirawai, Zamboanga del Norte,January 23, 2015:The DOLE-ZSFO personnel headed by Sr. LEO Elamsalih E. Ungad has successfully supervised the payment of separation pay to 137 (3 female) retrenched workers of Sirawai Pylwood and Lumber Corporation (SPLC) with a total amount of 3.9 million. The payment was made at the Human Resource Division Office of SPLC located in Barangay Guban, Sirawai, Zamboanga del Norte. The 137 affected workers include rubber tappers, foreman and record clerks under the Rubber Production Division of the company. The decision of the management to reduce their workforce was caused by the low production output of rubber trees coupled with the continuing decline of rubber price in the world market which the company could no longer cope up to sustain the business. At present there are at least a hundred workers left to continue the rubber production operation. 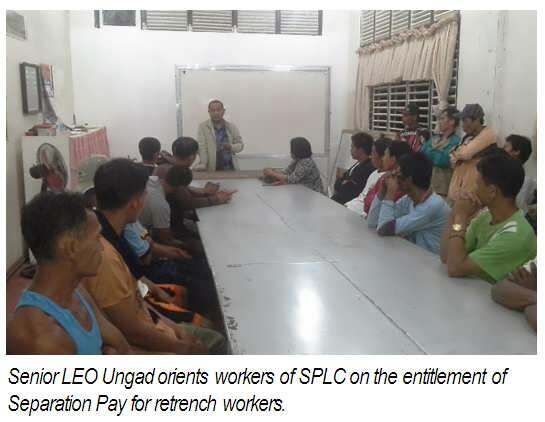 Prior to the release of payment to the workers an orientation on the salient provisions of the Labor Code specifically on separation was given by Senior LEO Ungad. It was then followed by LEO III Hector Yap who explained about the different programs and services of the DOLE which the affected workers can possibly avail. The management also gave a statement to the workers on this very unfortunate event which they hope can only be a temporary move. To help retrench workers in this difficult transition they offered miscellaneous jobs to those who are willing to work in the palm oil development division which is on its initial operation. They assured their workers that they will be the priority to be hired if the palm oil will be on its full operation. It is to be noted that of the 137 retrench workers, 60 comes from the province of Zamboanga Sibugay and because of the close proximity of DOLE-ZSFO to the location of the company, this Office was requested to supervise the payment of separation. The decline in rubber price and production issues has continue to pose economic challenges in the rubber industry especially for rubber workers and families in Zamboanga Sibugay. But despite this economic pains the peaceful collaboration through tripartism between labor, management and DOLE made this difficult times seems easy.